Practicing since 1998, Dr. Anthony Liang built his practice on his passion for helping patients improve their quality of life through better vision and eye health. He earned a B.S. in biology from Millersville University. 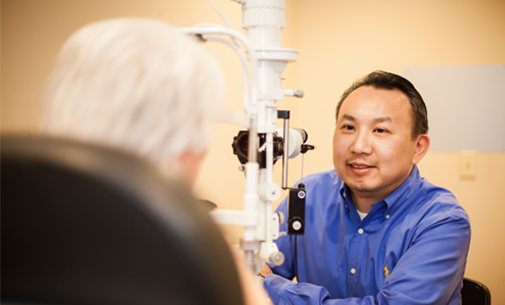 Pursuing his interest in the sciences and optics, Dr. Liang completed his doctorate of optometry at the Pennsylvania College of Optometry at Salus University with honors in low vision. He has resided in Lancaster County for more than 30 years and is a graduate of McCaskey High School. Dr. Liang is married to Dr. Anh Nguyen-Liang, who is also an optometrist, and has two children. In his free time, he enjoys fishing and water sports. Don’t just take our word for it. Here is what patients are saying about our practice. Liang Eyecare has to be the “Best”place to go if you need Eyecare. I have used Liang Eyecare for several years and can honestly say that there is not another eyecare facility that provides equal service in south central Pennsylvania. They are so thorough, making sure that no issues are overseen when going through examination. I almost lost my sight a few years ago in my one eye but thanks to Dr. Liang he located a problem and sent me to an eye surgeon who was able to correct my problem in time. Dr. Liang takes time with me like no other doctor I’ve ever visited has. I leave the office feeling like I’ve had a visit with a friend who just happens to be a great eye doctor. Dr. Liang has been taking care of my eyes for more than 10 years and I would never consider using another office. Thank you Dr. Liang for taking my vision to the next level up. Your expertise and advise, the personl professional service, the frames, the varilux lens is magic. You opened my eyes to a whole new world…Thank You. When you need eye care Liang Eyecare is the only place to go.